Capsule CRM was launched in 2009 by Zestia, Ltd. It was developed out of frustration with CRM solutions that were deemed either overly simple or too complex for the average small business. It was intended to empower small businesses to stay organized, know more about their customers, build strong relationships and make the most out of sales opportunities. Today, Capsule CRM is used by thousands of businesses worldwide. 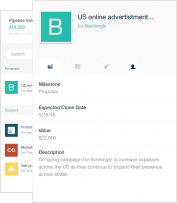 Note: Capsule CRM has only two plans – one free and one paid (Professional). The Professional plan is pay-as-you-go only, which is to say, month to month. The Capsule CRM website provides a small knowledge base with popular articles on common topics, such as How to Import Contacts, or integrating Google Apps. That Support Portal is available here. Also accessible via the Support Portal is a short troubleshooting guide for connectivity and browser requirements. If customers face further difficulty, they can contact the Capsule staff through the online ticketing system or via email at support@capsulecrm.com. Customers can expect a response between Monday and Friday. There does not appear to be direct support via web chat or phone. 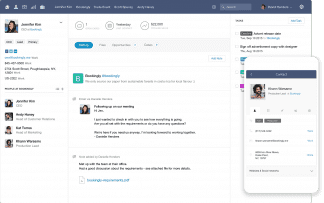 Capsule CRM is a lightweight platform with basic contact, task and opportunity management for a small business, particularly freelancers, or a company with established business processes but wants a unified online rolodex and communication log. It’s fairly short on features, as far as CRMs go, but it comes at a very affordable and simple pricing scheme. Aside from the free version, which gives some storage for documents and contacts, there is one plan – the Professional plan – which is pay as you go, no long term contract. In fact, the first month of the Professional plan is free, so you can try it first, change your mind, and walk away with no strings attached. A deal like that suggests a company secure with its product, and for what it offers, Capsule CRM does well. 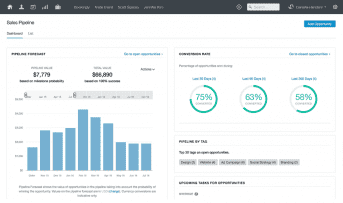 It’s got a simple and intuitive UI, which is cosmetically customizable – you can change the brand logo and color scheme – and divided into five dashboard views: Home, People & Organizations, Calendar & Tasks, Sales Pipeline, and Cases. The Home view shows your timeline of upcoming tasks and a feed of your latest updates. 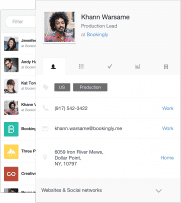 People & Organizations shows your contacts list, which can be filtered and exported as CSV, Excel or vCard, emailed through your mail client or via MailChimp, marked with tags or notes en masse or deleted. (Deleted contacts remain in the system for 30 days before disappearing.) The Calendar & Tasks view shows precisely that, and allows filters for task assignment by category and status. The calendar can be integrated with Outlook Calendar, iCal or Google Calendar. The Sales Pipeline shows rudimentary reports on past and forecasted performance based on opportunities entered to the system. It includes charts on Pipeline Value, Total Value, Pipeline by Milestone and Conversion Rates. It’s definitely not the reporting tools available in heftier CRMs like Zoho or Infusionsoft, or comparable lightweight, low-cost options like Insightly, but if your data is simple and you don’t need complex analytics right now, it’s still better than nothing. Finally, the Cases view provides platform for dealing with customer service issues. Cases allow a detailed view of requests and can be shaped by configurable ‘tracks’ to inform what needs to be done next. The track doesn’t automatically complete the task – it merely applies the predetermined “to-do” list. The Professional plan includes greater for files and contacts as well as official integrations that include Xero, Freshbooks, MailChimp, Wufoo, FreeAgent and Zendesk. These go quite a ways towards extending functionality for accounting, billing, expenses, customer support, and so on. There is a mobile app available for iOS and Android, and mobile-specific add-ons, such as a business card scanner which automatically creates a contact within the CRM. The mobile app can be used offline as it will automatically sync when the connection is regained. Capsule provides a developer API and has reported a 99.99% uptime over the past 12 months. While it doesn’t offer integrated phone services, if you have a preferred VoIP tool (such as Skype, Blink or FaceTime) you can setup one-click calling. You can also import contacts from Outlook or Google Contacts or via CSV or vCard. All in all, if you’re a business that needs an out-of-the-box CRM to manage and score leads, apply nuanced filters for highly-specific reports, provide a unified inbox for customer support, first-party social media integration and technical support if you run into problems, then you probably want a heavier duty CRM than Capsule. On the other hand, if you want a lightweight platform with effective contact management (along with optional profile enrichment drawn from Facebook and Twitter), email tracking, simple metrics and collaborative tools, a surprising degree of adaptability, a relatively low price and absolutely no strings attached if you decide to walk away, then Capsule CRM is a very solid choice. What Do You Think of Capsule?